Today I’m delighted to welcome Andy Graham to Virtual Book Club, the interview series in which authors have the opportunity to pitch their novels to your book club. British author Andy was born and brought up on the fringes of Europe, and now lives in the heart of Europe – Prague. He says that he has too many interests for the hours of the day and a young family with too much energy to allow him to go grey peacefully. He is a member of the British Blues Awards Hall of Fame, and has toured extensively across Europe, and occasionally beyond, playing bass guitar. 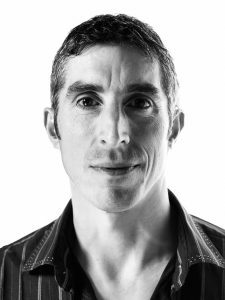 He now does local gigs, work as an osteopath in the Czech Republic and sports massage teacher in the UK. He writes political thrillers, dystopian fiction, creepy reads, and dark humour. 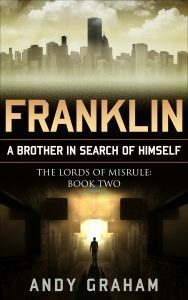 His main series The Lords of Misrule is a dystopian political thriller for the 21st century. He also has a collection of 5 short ‘creepy reads’ available. Until the end of April, you can pick up the first two books of the Lords of Misrule FREE from his website. 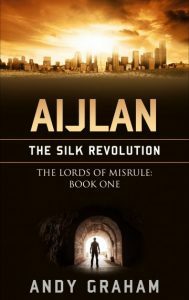 Q: Andy, today we’ll be talking about Aijlan – The Silk Revolution, Book One of The Lords of Misrule. What is it that makes Aijlan particularly suitable for book clubs? It’s topical, ambiguous, and not too long (around 55K words). The book is a dystopian political thriller set in an alternate world very familiar to our own. There aren’t any ray guns, aliens or teenage girls struggling with their role as the Chosen One – that’s been done much better than I could. I’ve also tried to make it as balanced as a dystopian novel can be, rather than just a tale of them vs. us grievances. The story draws on events that are dominating our current news: protectionism, centralisation vs. devolution of power, nationalism and religion. Though these elements aren’t the main thrust of my novel, without them, the story wouldn’t have the background to provide the conflict necessary to a good book. These elements should give any book club plenty of things to talk about. Roughly. I knew where I wanted the story to start and finish, I knew what the twist at the end was going to be, but I wasn’t entirely sure how I was going to get there. If I want to be completely honest here, I think that shows in the finished book because the pace dips a bit around half way through. I culled a lot of extraneous text to try and speed it up, but I didn’t have the heart to get rid of anymore. Partly because the story benefits from it, even though it may not be essential, and also because it allows me to make the characters’ motivations more ambiguous – something which appeals to me much more than the cut-out-and-keep-characters (with a token dark secret or flaw) that populate so many books these days. I wrote Book One in part to satisfy some people who wanted more information about the characters, in particular Bethina Laudanum who is central to the overall story arc of the series, and also to clarify some of the back story to Book Two in my own mind. Q: Where is Aijlan set and how did you decide on its setting? It is set in an alternate world. The country of Aijlan (pronounced ‘eye-lan’) is based on the UK. The eponymous capital of Aijlan is a mash-up of London and Prague. (I lived in the former for fifteen years and have lived in the latter for eight). London’s Houses of Parliament became Aijlan’s Palaces of Democracy, the river Thames the river Karth. Prague’s Powder Tower makes a cameo as the Gunpowder Tower (with the Guy Fawkes story thrown in), and so on. I liked the idea of having a world that is familiar to our own, with technology and people that readers would recognise, but still have license to play around. When a father discovers the murderous truth behind the Silk Revolution, he is faced with the choice of risking everything by doing what he knows to be right, or living the rest of his life behind a lie. I realise that sounds like an elevator pitch, but I was intrigued by the concept of how much a person would sacrifice to uphold their principles. That’s essentially the story. The rest of it, the struggle between those that rule and those that would, tribalism, power games, the love interest, and so on are all secondary. Q: Why a political tract? Politics is a battle of ideals fought with words. Bombs, machetes, taxation, and so on are the final manifestation of that battle. Poets and songwriters have been using words to fight the good fight for millennia. Why should literature be any different? I do think it would be a dull world if ALL literature were political but I have no problems with fusing the two. After all, it could be claimed that politicians fuse fact and fiction all the time, so why shouldn’t writers? I think it’s interesting that sale of the dystopian/ political classics such as 1984, Brave New World, and Farenheit 451 have boomed since the last American election. The reading public are voting with their wallets, and proving that there is life in political fiction. Brexit. The 2016 American Election. The Velvet Revolution. The rise of the right in the EU. They all had an influence on the plot, though many of those influences don’t become more obvious until the second book in the series. As to the responsibility that comes with this, I think I have managed to present a balanced view. Readers of the book will probably realise which side of the argument I fall on, but I have tried to give all sides of the debate space on the page without being too preachy or dismissive. Q: Are you looking to entertain or illuminate? I think the primary aim of a fiction writer is to entertain, but I also think that you can illuminate as you do that. It’s similar to education in that the best form of education is that which engages the student. Should that extend to fiction, too? You can argue that it shouldn’t, but as long as it doesn’t distract from the story and the book doesn’t start reading like a Wikipedia page, I don’t see a problem. That being said, there are times when I just want ‘bubble-gum for the brain’, and don’t want to be confronted with facts. I have enough facts (both real and ‘fake’) and opinions clogging up my social media feeds that there are times when I just want the freedom from reality that fiction can bring. The other consideration is how you define ‘entertainment’. Does this mean laughter, joy, and fun? Or does it mean also an emotional reaction such as sadness, anger, and indecision? I hope that Aijlan, though ‘spiky & gritty rather than happy’ to quote one reviewer, does provoke an emotional response and illuminates. And, unlike poor old Maximus Decimus Meridius, I hope that “I do entertain”. Believable characters. Life is about stories. Stories are about people. Yes, you can have beautiful, descriptive prose, but it’s the human emotion behind stories that make them live. Plot. If you have characters that behave like real people, and their motivations add up, then the plot is next. I don’t mind the occasional ‘hole’ in the story, as long as the overall effect works. Aijlan started out as a prequel for the rest of The Lords of Misrule series. As I mentioned above, it was written after the subsequent book, even though it’s set before it. There’s a time gap of a generation between Book One (Aijlan – The Silk Revolution) and Book Two (Franklin – a brother in search of himself). The missing years are slowly filled in throughout the series. Book Three (Rose – A Mother’s Unreason) was released in March this year (2017) and follows directly on from the preceding book. I also have a collection of creepy reads – short stories of dark fiction, horror, and suspense. The Lords of Misrule touches on these themes, but the short stories are a concentrated version of the darker end of what is in The Lords of Misrule. Again, with these I’m trying to deal with personalities and plots, ideally with a twist in the tale, rather than just unleashing a literary gore-fest just for the hell of it. My wife has asked me why I write these dark stories. It’s tempting to quote Stephen King at this point: “What makes you think I have a choice?” But other than not always seeming to be in control of what appears on the page, I find exploring these darker themes helps me deal with a lot of things I stumble across in the news or history. Q: Jodie Archer said that when she worked at Penguin UK, she found that manuscripts by new authors were too ambitious, like a painter who can’t settle on one colour and uses the whole paint box. How has your writing style changed over time? I think that’s a great observation. 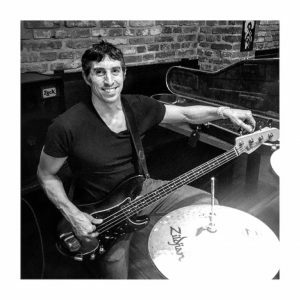 In one of my other lives, I’m a musician and I think the same thing can be said about new players: the more space you can fill with noise, the better. As for how my writing has changed? It’s more concise. I’ve cut back on the prose, sharpened up the dialogue, and am starting to experiment more, for example with brackets (I love books with brackets). One of the recurring comments about the first book I wrote (Book Two of the series) was that it was ‘very evocative’ and had ‘great prose’. When I then wrote Aijlan (Book One), I pushed that element to try and play to my strengths. In retrospect I should have used it more sparingly. I have since gone back through both books to cut out any ‘flab’ and to bring them into line with Book Three, which is more in line with how I envisaged the earlier books. Yes! Losing my kids is one of my greatest fears. This crops up in Aijlan when the main protagonist is faced with a choice that involves his daughter. It also appears in some of the other stories in various guises (including a character who avoids having children for fear of failing them). I’m not sure I really understood that primal fear of losing part of yourself before. I lost a brother when I was in my twenties. That was hard. Twenty-odd years later, I still can’t even hope to imagine what it must have been like for my parents, and I pray that I never will find out. But, in a way, having kids of my own, I am a little step closer to understanding. On a more positive note, things my kids have said and done also crop up in my stories: some of the funny things, and some of the repetitive grind that is part and parcel of having young kids. Q: Writing is undoubtedly a lonely occupation. P D James says that it is essential for writers to enjoy their own company. Are you a natural loner? Not as much as I like to think I am! 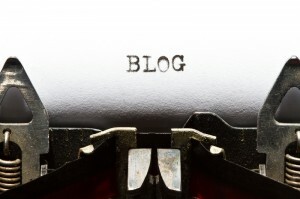 Want to find out more about Andy and his writing? Find him on Facebook, follow him on Twitter, and don’t forget that until the end of April, you can get a free starter pack via his website. Remember, if you enjoyed this post please share it. If there’s anything else you’d like to ask Andy please leave a comment.